And when victims aren’t asking themselves, somebody else is sure to pose the question. “How on earth could you have been taken in to that extent?” The characteristic answer: “You had to be there. It seemed reasonable, plausible at the time.” The clear--and largely valid--implication is that had we been there we too might have been sucked in. Some people are simply too trusting and gullible for their own good--ready targets for any smooth talker who comes along. But what about the rest of us? The sad fact is that we are all vulnerable. Few people are such sophisticated and perceptive judges of human nature that they cannot be taken in by the machinations of a skilled and determined psychopath. Even those who study them are not immune; as I’ve indicated in previous chapters, my students and I are sometimes conned, even when aware that we’re dealing with a probably psychopath. But there is something else about the speech of psychopaths that is equally puzzling; their frequent use of contradictory and logically inconsistent statements that usually escape detection. Recent research on the language of psychopaths provides us with some important clues to this puzzle, as well as to the uncanny ability psychopaths have to move words--and people--around so easily. But first, here are some examples to illustrate the point, the first three from offenders who scored high on the Psychopathy Checklist. Think about this for a moment--not only lies but several contradictory statements in the same breath. Very perplexing. It is as if psychopaths sometimes have difficulty in monitoring their own speech, and they let loose with a convoluted barrage of poorly connected words and thoughts. About his many experiences, Olson said. “I’ve got enough antidotes to fill five or six books -- enough for a trilogy.” He was determined not to be an ”escape goat” no matter what the ”migrating” facts. In most people the two sides of the brain have different, specialized functions. The left cerebral hemisphere is skilled at processing information analytically and sequentially, and it plays a crucial role in the understanding and use of language. The right hemisphere processes information simultaneously, as a whole; it plays an important role in the perception of spatial relations, imagery, emotional experience, and the processing of music. Nature probably "arranged" for each side of the brain to have different functions for the sake of efficiency. For example, it is clearly more effective for all the complex mental operations required to use and understand language to take place in one side of the brain than if they were distributed over both sides. In the latter case, information would have to be sent back and forth between the two hemispheres, which would slow down the processing rate and increase the chances of error. Further, some part of the brain has to have primary control over the task; if the two sides of the brain were competing for this control, the conflict would reduce the efficiency of processing. Some forms of dyslexia and stuttering, for example, are associated with just such a condition: Language centers are bilateral--located in both hemispheres. Competition between the two hemispheres makes for a variety of difficulties in the understanding and production of language. New experimental evidence suggests that bilateral language processes are also characteristic of psychopathy. This leads me to speculate that part of the tendency for psychopaths to make contradictory statements is related to an inefficient “line of authority”--each hemisphere tries to run the show, with the result that speech is poorly integrated and monitored. Of course, others with bilateral language--some stutterers, dyslexics, and left-handers--do not lie and contradict themselves the way psychopaths do. Clearly, something else must be involved. This P is educated, well-read, but would make insanely contradictory statements and in writing it was ridiculous. I have found in listening to the person in my life speak, i have to determine which side of his mouth he is speaking from. They do contradict themselves constantly. And if you try to call them on it, watch out! Thanks again for this blog. 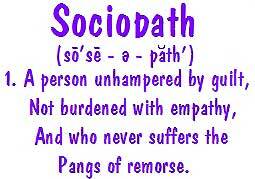 I continue to learn as well as to try to help others become educated on psychopaths, sociopaths, and narcissists. Unfortunately there seems to be more around then thought. Lives are being shredded. I find the churches are becoming a popular place for these individual. Then the spiritual abuse aspect gets brought in! Whenever I would question the P when I felt he was lying about something, the creepiest thing would happen with his mouth. He would give me a certain response and then his mouth would still be making shapes as though other stuff was coming out, but it was silent. I always wondered what he would have been saying if the volume suddenly got turned on. Talk about leaking expressions!!! My number one way of detecting psychopaths around me is by being sensitive to contradictions. Practicing this has made contradictions become very blatant to me, I zoom right in on that dysfunctional habit they have. I'm confused!?! My husband is dyslexic and lies constantly! Also for years when we first met he would stutter really BAD when he was LIEING! So is he a sociopath? !